Being able to edit videos can be immensely beneficial – but it is also notoriously complicated and requires a great deal of experience. At the end of the day however it all comes down to the video editing software itself, which is what makes Movavi Video Editor for Mac such an attractive option. In a nutshell, Movavi Video Editor for Mac is a video editing software for Mac that is designed to be user-friendly. Unlike other editors that have steep learning curves or require a certain degree of technical expertise, it adopts an intuitive approach that is far more beginner-friendly. While you may have run into user-friendly editors in the past only to find that they only have the most basic features and come with lots of limitations – there’s no need to worry about that with Movavi Video Editor for Mac. In fact, if anything you may be surprised by the scope of what it has to offer. To help provide a smooth and user-friendly experience, Movavi Video Editor for Mac’s interface is designed to be clean and simple. It has a timeline-based structure with convenient icons placed directly above it to make it easy to process and edit the raw footage that you load into it. All of its other features are similarly easy to access, and most are neatly organized into tabs so they can be located without any difficulty. No matter how advanced some of the features may appear, Movavi Video Editor for Mac goes to great lengths to simplify them and make them easy to apply to your videos. One way in which it does that is by ensuring its features can be applied using relatively basic and familiar actions. In some cases that may mean that you have to drag and drop an element into place, while in others you may adjust a slider, resize a frame, or perform some other action of that sort. Overall this approach makes it easy to figure out how each of Movavi Video Editor for Mac’s features works just by experimenting with them. It should only take a minute or two for you to try out any given feature and see how it can be applied to your videos. Compile and cut videos Add videos or folders of videos to Movavi Video Editor for Mac and arrange them in the order that you want to compile your own video. Additionally, you can cut videos and split them into segments or trim out any parts that you don’t want. It is also possible to add images to create a slideshow or as cut-ins between parts of your video. Enhance the video quality All you need to do to start improving the quality of your video is use the enhancement tools in Movavi Video Editor for Mac to manually adjust the brightness, contrast, hue, saturation and other color settings. If you want you could also fix any problems with the video, and correct shaky, interlaced, blurry or pixelated video segments. Using the ‘Magic Enhance’ feature you will be able to automatically enhance your video with a single click. Add and edit audio tracks Assuming you want to include background music or a voiceover, you can add audio tracks to your videos with Movavi Video Editor for Mac. The equalizer settings can be adjusted as well, or you can edit and improve the audio in other ways such as by removing background noise, normalizing quiet segments, or applying audio effects. Additionally, you could record a voiceover for your video on the spot via a microphone. Apply visual effects To make your video stand out and give it a unique visual appearance there are lots of visual effects that you can add within Movavi Video Editor for Mac. If you want you could stylize your video using filters, apply special effects, or place animated transitions between segments of video. Another way to up the ante of your videos visually is to add text elements that can be customized or animated to create unique captions, watermarks, subtitles, and more. Conveniently save and optimize the video After you’re done you will be able to save the video that you’ve compiled in any format that you require. Alternatively, Movavi Video Editor for Mac will provide you with presets for most devices and platforms that you can use to automatically optimize your video using the best video format and settings. In short, you should have no trouble saving your video in the perfect form to be displayed on any device or platform. While this is by no means the full scope of Movavi Video Editor for Mac’s features, it should help you to see just how comprehensive it is. Overall you should be able to edit your video in any way that you require with the features and tools that it provides, and it is likely to open up some options that you may not have considered yet. 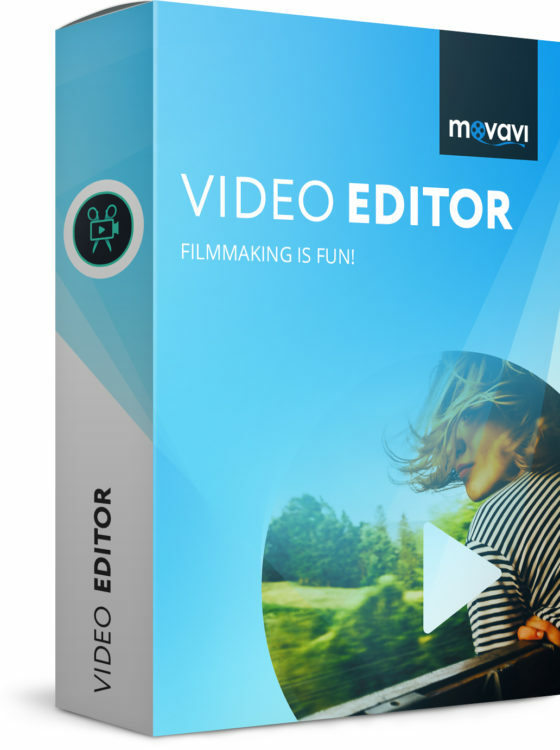 If you want a video editor that is easy to use and has features so you won’t have to reign in your creativity when editing a video – Movavi Video Editor for Mac should be able to provide exactly what you’re after. Its intuitive approach coupled with its powerful features make it an excellent editor. For beginners, Movavi Video Editor for Mac will make it easy to start editing videos without having to go through a steep learning curve. On the other hand, if you’re a more experienced user you still stand to benefit from it, as you’ll find that you’re able to make alterations to your video much more quickly and effectively with its tools.